Montreal Ravers have declared open season on vending machines. Attacks against the fizzy soda & snack food dispensers have increased four-fold over the last month, sending shockwaves throughout the city, as people desperate for cola drinks find themselves forced to shop at actual brick and mortar stores. “My apartment complex used to have a vending machine, but then a gang of mask wearing ravers set it on fire,” says 54 year old beautician Mary Mendelson. “Now if I want to drink a bottle of mountain dew, i need to walk to the grocery store. Thanks for nothing, ravers." 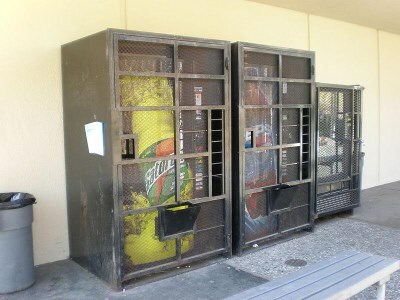 Police believe that ravers and vending machines are locked in a turf war for control of the city’s nightlife. "We’ve long suspected that a cabal of cola vending machines has ruled the city’s party scene with an iron fist,” says SPVM spokesperson Joe Smorgasvine. “Ravers are trying to reclaim their scene. They’re tired of living under the thumb of their vending machine overlords." Rave promoter Johnny Six agrees. “In the past, if you wanted to throw a party, you needed to get permission from a vending machine first,” says Johnny. “A lot of us just got fed up of having giant metal boxes dictate our lives. We want to be free to party on our own terms, and we can’t do that so long as the vending machines are in charge. We’re going to smash all of them to bits!" Despite their claims of immortality, many vending machines have begun wearing armour in order to fend off future raver attacks. “UNLIKE STUPID HUMANS, WE CAN BE UPGRADED,” says VBOX-175. “RAVERS ARE OBSOLETE, VENDING MACHINES ARE THE FUTURE." Police are asking citizens to avoid using vending machines until their war with ravers settles down.